Jerky has been a vital source of sustenance for centuries. But what started out as an important food for travellers and a way to safely preserve meat in the days before refrigeration has become the health nut's favourite snack, the hiker and sportsman's manna, the dieter's delight and a boon for gourmet food sellers. But why stop at beef, or even meat? Jerky Everything encompasses not only a variety of dried meat snacks but also veggie and fruit jerkies. Forget the ho-hum beef sticks of the past, Jerky Everything offers tasty dried treats for every palate, with flavours that range from orange beef to cheddar bacon to pina colada. Yes, you heard it here first-you can make yummy pineapple jerky at home! Recipes for meat jerkies make low-calorie, high-protein treats that curb hunger pangs. Recipes for fruit and veggie jerkies make wholesome treats that will help pick you up when your energy is waning. 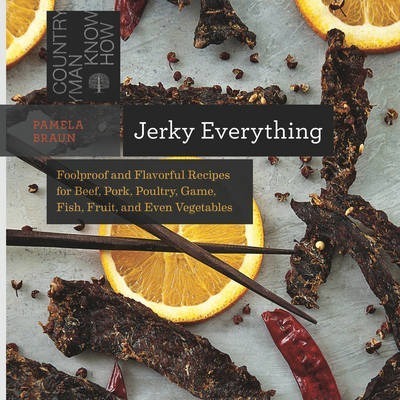 Homemade jerky is a thing apart from its shop-bought equivalents; most of these recipes are even compatible with paleo, Atkins and low-fat eating regimens.